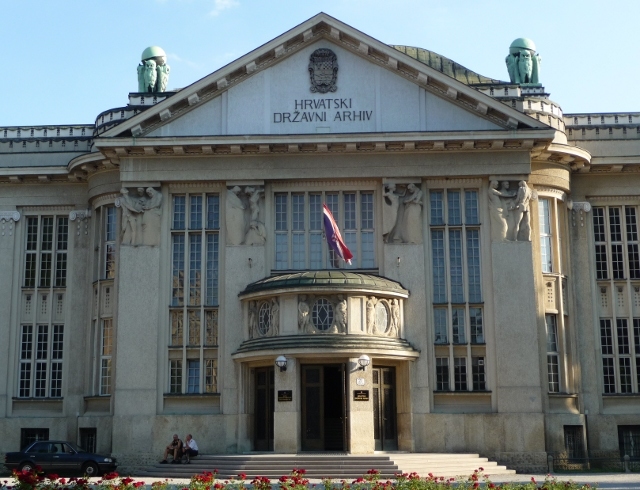 We couldn’t leave Croatia without visiting its capital, Zagreb. After leaving Samobor we headed to the only handy campsite, just behind the motorway services south west of the city. Luckily, and contrary to what we’d heard, there were transport links from here into the centre. A bus left from a village just a short walk away and linked into the tram system about halfway into the city. Glad to find it a basic but good and fair priced site, we parked up, hooked up and caught the next available bus. 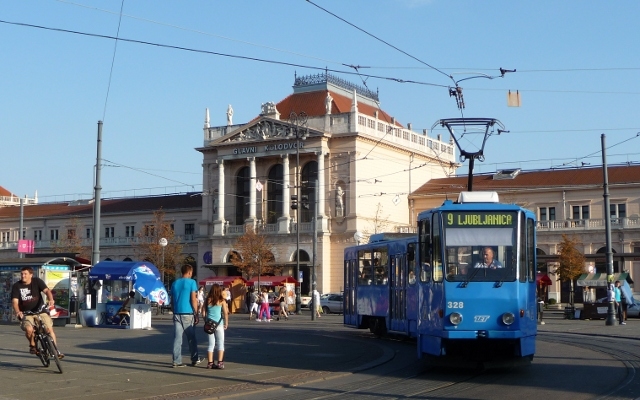 Within 40 minutes, including a hunt for the right tram stop, we were in Zagreb itself. We arrived in the central square in the lower town ‘Donji Grad’. The older parts, and most of what we initially wanted to see was in the older upper town ‘Gornji Grad’ area – just a stone’s through away. 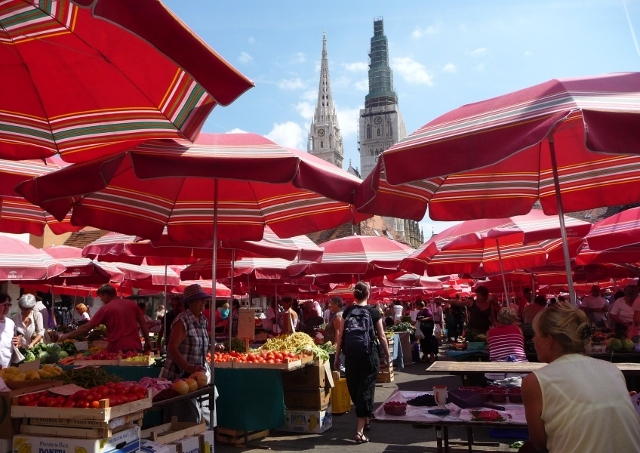 First off was a wander through Dolac – the extensive indoor food markets on the lowest level and stairs up the colourful open air fruit and vegetable market above it. We always hit the best markets at their height in the early part of the day when we are unsure what our plans are and can’t take as much advantage of the tempting produce on offer as we’d like. 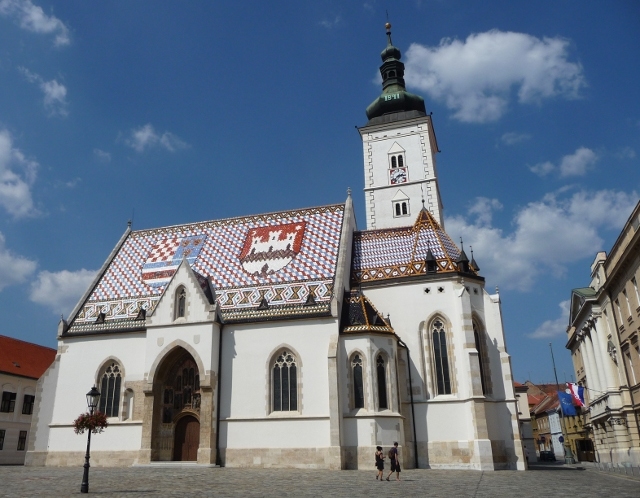 However, a welcome drink in the flower market area set us off for an extensive wander, taking in the cathedral and then down Radićeva,the picturesque street which divides the rival Gradec and Kaptol districts and is lined with bars and restaurants. Being August the city is relatively quiet we learnt, its inhabitants on holiday, including our friends Yankee and Maja, unfortunately for us, and most tourists also at the coast. We spotted a tiny old world checked-tablecloth restaurant with its cool terrace hidden away from the street. The Mikina Klet serves up traditional food at very reasonable prices and we tucked into the local speciality ‘stari purgers’, not a variation on a hamburger, but savoury pancakes stuffed with spinach or ham and smothered in a creamy cheesy topping. 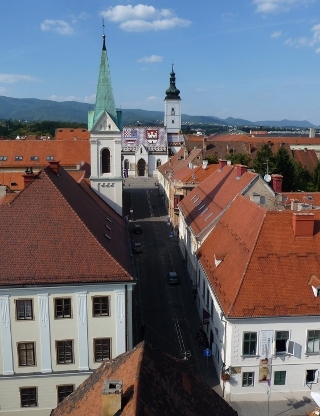 We climbed the stairs to the Gradec area, finding pristine old streets and squares of mostly newly renovated and painted Austro-Hungarian era buildings, the city’s Whitehall and museum district rolled into one. 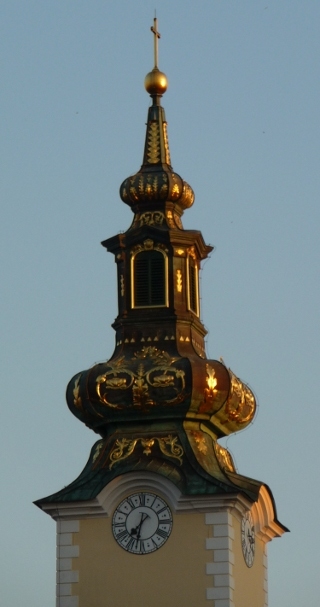 The garishly colourful roof of St Mark’s church was its centre-piece. 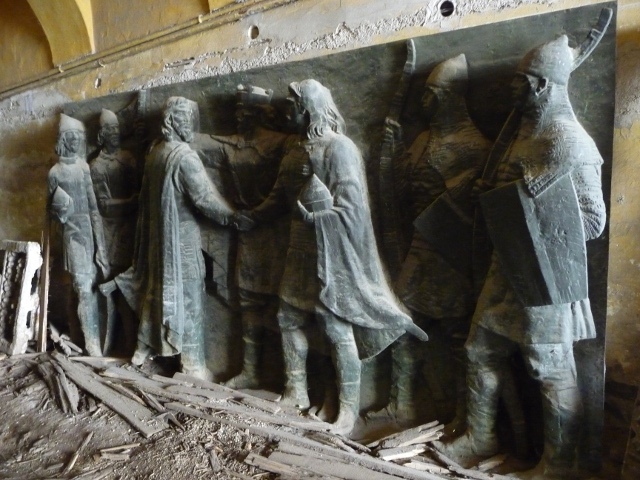 On the other side of the square a building was being refurbished, in a passageway alongside it stone reliefs were against a wall, and exploring beyond found more stone artifacts lying around. The stone gate into Gradec was more of a cobbled passageway under buildings housing a shrine to the Virgin Mary with a sixteenth century statue behind a grille purported to have miraculous powers. 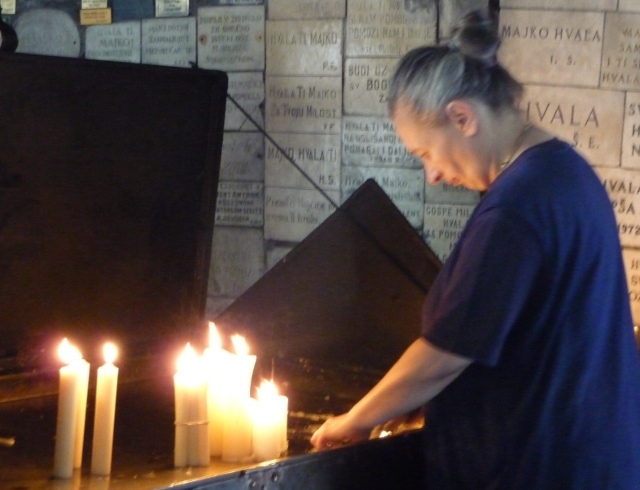 There was an alcove to one side with pews for worshippers and it was lit by votive candles. The tray these were placed in was overseen by a wax lady. Not a lady made of wax but the one who was responsible for scraping the wax away to avoid any conflagrations. It was Saturday afternoon and most of the museums were closed so we explored the streets and found an intriguing museum that was open. We’d seen brown signs to the Museum of Broken Relationships and here it was looking both funky and open. Conceived in Zagreb and functioning as a touring museum too, the rooms display significant items from broken relationships together with their stories. It was strangely compelling, from teddy bears to artificial limbs … tales of love, requited, unrequited, and loss – long distance romances not lasting, or the death of a loved one. Fr om here we looked up at Kula Iotršćak or Burglars’ Tower, part of the city’s fortifications. We climbed to the top for the views and to see the cannon which is fired at noon every day. We’d somehow failed to notice this earlier though. 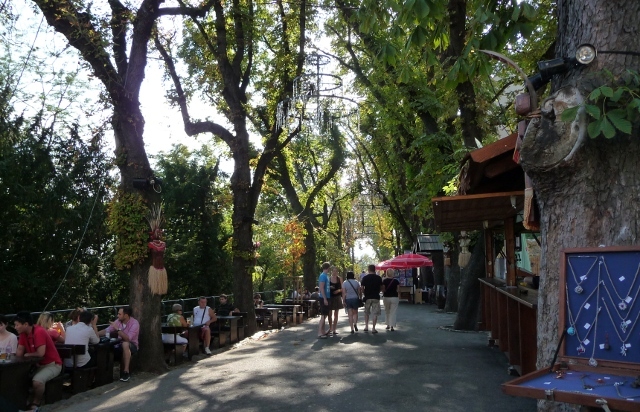 Below this a tree-lined pathway, Strossmayerovo šetalište, lead along the edge of the hill overlooking the lower town with arty stalls and a bar with tables alongside at which we supped a beer. Late afternoon and we thought a little retail therapy was in order before we embarked on a walking tour of the lower town. We found one of the main shopping streets we’d passed in the tram earlier, but … it was deserted. The shops were closed, they closed at 3pm and weren’t reopening later as we would have expected in a major city. 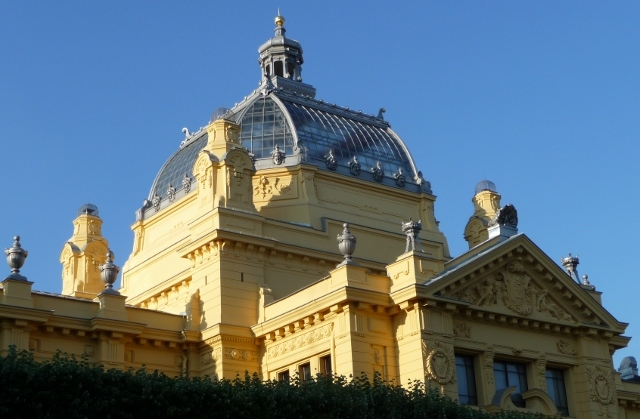 I would have off ered Zagreb up as a perfect weekend break destination – but with the museums closed on weekend afternoons and Mondays, and the shops closed so early on a Saturday and many of them closed on Sundays too, just make sure you are there on a Friday or a Tuesday as well. By the time you’ve oriented yourself it’s time to go home. But it isn’t really because there’s always the u-shaped walking tour of the lower town. Known as Lenuci’s horseshoe after the town planner who set it out, it took us past the big city regal buildings – archives, libraries, theatres, more closed museums, parks and botanical gardens. 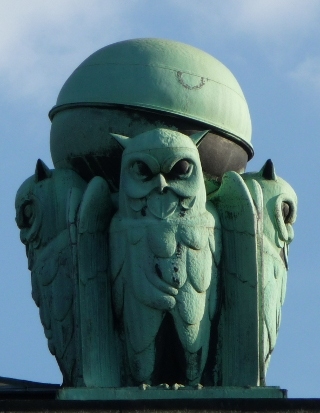 We were particularly taken by this art nouveau building, designed by Rudolf Lubynski in 1913 – the National Archives with its owls. 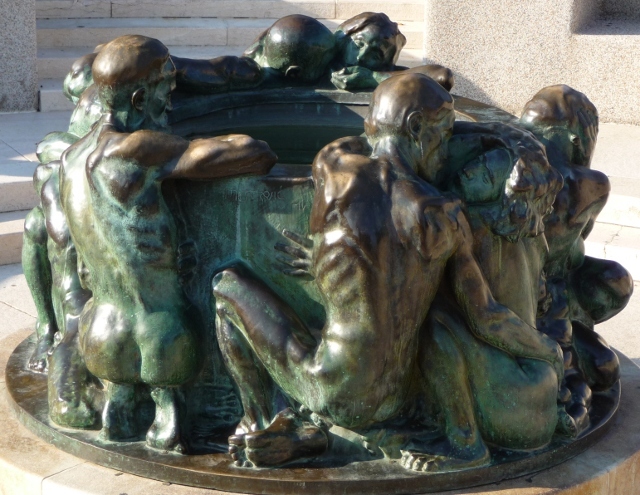 In a park near this you can see sculptor Ivan Meštrović’s wonderful ‘Well of Life’ created in 1905. Another of our favourites was the yellow art pavilion set in another green space near the also grand railway station where a tram driver paused his tram for my photo. After all that walking around we had earned another beer. We headed back to Radićeva which was getting lively with the early evening passegiata. Great people watching as a beer and mojito were drunk while we tried to figure out our timings around the few remaining buses back to the campsite. In the end we found another lovely bar with its own brewery which did big plates of food for very little money. We dug in there for the evening and continued our perusal of the rest of the population, taking pictures of St Katharine’s spire as the last of the sun’s rays caught its golden decorations. Eventually we caught the last bus back having overshot our tram stop and waiting for a tram back from the next stop. Luckily we were very early for the bus, especially so as it was already waiting. Our timetable said it left at 10.45, but barely a minute after we sat down the driver climbed aboard and promptly closed the doors and set off at 10.30. You must have been able to feel the sense of relief hovering in the air around us. We’d had a great Saturday out in the city. Sounds like you are having a great time ! Will you ever see Chorleywood again ! Can I be the first to wish you Happy Birthday for tomorrow Ellie ! Hope you have a lovely day !!! !